Advocate staff photo by JOHN McCUSKER -- The Traveling on a very high Mississippi River, a barge seems set to mow down the city skyline as seen from the Lower Ninth Ward at Holy Cross. A flood warning for the New Orleans area was issued by the National Weather Service. The Mississippi River ris expected to reach 16 feet on Saturday and flood stage, 17 feet, on January 15. Advocate staff photo by PATRICK DENNIS -- The Corps of Engineers plan to open the Morganza Spillway in the next few days here at the flood control structure just north of the town of Morganza. Advocate staff photo by PATRICK DENNIS -- Current Mississippi River forecasts indicate that the U.S. Army Corps of Engineers will not have to take the flood control measure of opening the Morganza spillway to divert river water into the Atchafalaya Basin. Advocate staff photo by BRAD BOWIE -- Soldiers with the 256th Infantry Brigade unload supplies at the Amelia Recreation Center on Jan. 7, 2016. Advocate staff photo by BRAD BOWIE -- A swollen Atchafalaya River flows through downtown Morgan City on Jan. 7, 2016. Advocate staff photo by BRAD BOWIE -- Morgan City resident Bo Hannegan poses a question to a panel of engineers on Thursday, Jan. 7. 2016, at the Morgan City Auditorium. The meeting was held to discuss the Corps of Engineers' plans to open up the Morganza Spillway, which could cause flooding. Advocate staff photo by BRAD BOWIE -- Members of the public attend a meeting at the Morgan City Auditorium on Thursday, Jan. 7, 2016, to hear the Corp of Engineers' plans on opening the Morganza Spillway. Advocate staff photo by BRAD BOWIE -- Randy Deshotel poses a question to a panel of engineers on Thursday, Jan. 7, 2016, at the Morgan City Auditorium. The meeting was held to discuss the Corps of Engineers' plans to open up the Morganza Spillway, which could cause flooding. Advocate staff photo by BRAD BOWIE -- St. Mary Parish President Paul Naquin speaks at a public meeting held on Thursday, Jan. 7, 2016 at the Morgan City Auditorium by the Corps of Engineers to discuss their plan to open the Morganza Spillway. Advocate staff photo by BRAD BOWIE -- Colonel Richard Hansen, with the U.S. Army Corps of Engineers, discusses the Corps' plan to open the Morganza Spillway during a panel held at the Morgan City Auditorium on Thursday, Jan. 7, 2016. Advocate staff photo by BRAD BOWIE -- Colonel Richard Hansen, with the U.S. Army Corps of Engineers, left, and Mike Stack, Chief of Emergency Operations with the Corps, right, look over a map before the start of a panel held at the Morgan City Auditorium on Thursday, Jan. 7, 2016. The meeting was held to inform the public on the Corps' plan to open the Morganza Spillway, which could flood the area. Standing is St. Mary Parish President, Paul Naquin. Federal officials warned people living in the Atchafalaya Basin Thursday that rising Mississippi River waters may force them to open the Morganza Spillway to protect levees downriver in the Baton Rouge area. But Col. Richard Hansen, head of the U.S. Army Corps of Engineers in New Orleans, cautioned St. Mary Parish residents that they could flood even if the spillway isn’t opened. Officials throughout Thursday said no final decision had been made whether or when to open the flood-control structure that diverts water from the Mississippi into the Atchafalaya River, but Hansen, during a night meeting in St. Martin Parish, said it could happen as early as Tuesday. 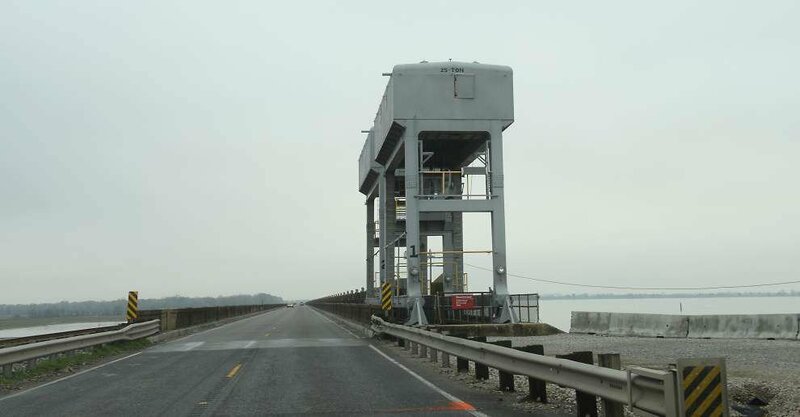 The Corps did announce that river levels would force the opening of the Bonnet Carre Spillway on Sunday, channeling the high water in the Mississippi into Lake Pontchartrain to relieve pressure on the levees in New Orleans. Corps and parish officials said the Atchafalaya River, which flows between Morgan City and Berwick, could reach flood levels in a few weeks, especially if the Corps opens Morganza. “Now is the time to take temporary flooding measures,” Hansen said before a crowd of more than 300 people at the Morgan City Auditorium, one of several flood-preparation meetings being held this week across south Louisiana. Mississippi River water levels are rising because of heavy December rain up north, which already caused flooding in the Midwest, swamping a number of communities. The Morganza Spillway, designed to protect downriver levees on the Mississippi, has been opened only twice since construction finished in 1954. The spillway was operated in 1973 and, more recently, in 2011. The trigger for opening the spillway in northern Pointe Coupee Parish occurs when the river level reaches 57 feet at the structure and there is a 10-day forecast that shows the river will be flowing 1.5 million cubic feet per second. The forecast fluctuates, so the Corps is currently looking at how the new forecasts change the projections for the river flow, said Ricky Boyett, chief of public affairs of the Corps’ New Orleans District. Despite more water coming downriver during the 2011 flood, officials said different conditions in the Basin this year could mean the flooding people see on the ground should match up pretty closely with what happened almost five years ago. “Less flow on the Mississippi River, but yet you’re getting very close if not higher elevation (of flooding) in the Basin,” Boyett said. While some communities flooded in 2011, the expected deluge didn’t arrive in other areas in the Basin. Before the spillway was opened in May 2011, the Corps released a number of maps showing potential flooding of 5 to 10 feet in and around areas like Krotz Springs and Butte La Rose. Those warnings prompted St. Martin Parish, St. Landry Parish and other officials to issue mandatory evacuations for places like Happy Town, an area of camps and homes along the Atchafalaya River, and the small residential community of Butte La Rose. Although Happy Town was isolated by floodwaters, flooding in Butte La Rose and elsewhere in the Basin was much more limited than expected because extensive drought meant the ground absorbed much more water than expected. At a Corps meeting in Butte La Rose on Thursday night, officials told the approximately 400 people present that if they remained dry in 2011, they probably won’t flood this year. There is no planned evacuation at this time. “This is basically going to be a 2011 repeat,” St. Martin Parish President Guy Cormier said. But some experts cautioned that conditions are different this year than in 2011. There currently is no drought of any kind in the Basin to mitigate flooding, which could mean areas that didn’t flood in 2011 might see water this year. Richard Keim, associate professor with the School of Renewable Natural Resources at LSU who researches forested wetlands like the Atchafalaya River Basin, agreed that the levels of 2011 can’t be used to prepare for this flood. “Every flood is different. The conditions in the Basin and channel aren’t always predictable,” Keim said. Officials said they are concerned people in the Basin may base their current preparations on what they experienced in 2011 instead of listening to warnings about potential flooding in their areas. In St. Mary Parish, Corps officials and parish employees have been monitoring parish levees for sand boils, Hansen said. Sand boils form on the dry side of levee when water seeps under the structure and up through the other side. Although it doesn’t mean the levee is damaged, these sand boils do need to be watched to make sure no dirt or sand is making its way through, indicating a potential levee problem. Officials also are looking for cracks in the levees, he said, and are watching big boat traffic on the area’s many waterways for signs that they may be passing too close to the levees. About 130 National Guard troops from the 256th Infantry Brigade and the 225th Engineering Brigade were due Thursday evening at the Amelia recreation center on the east end of the parish to set up a command center. Guardsmen on Friday will unload earth-moving equipment for flood diversion work on Avoca Island, Guard Maj. James Williams Jr. said. Avoca Island lies about 3 miles southeast of Morgan City near Lake Palourde. The Coast Guard will close Bayou Chene, located north of Morgan City, on Saturday to install a “flood protection structure,” a barge that will be sunk in the waterway to divert water away from low-lying communities and into adjacent marshes. The barge project, which was also executed in 2011, was credited with preventing damage to several communities. Advocate staff writer Richard Burgess contributed to this story.